What were the most infamous volcanic eruptions ever recorded in the history of Iceland, and how did they come to influence the country’s geography and culture? When is Iceland's next volcano due to erupt, and what is the protocol should, on the off chance, an eruption occur during your stay? Read on to find out all you need to know about the largest volcanic eruptions in Icelandic history. 1 - Waiting On An Eruption? "The Hekla, perpetually condemned to storms and snow, vomits stones under terrible noise". Over the last few years, locals to South Iceland have begun noticing changes in the physical structure of Hekla stratovolcano, a dominating presence on the landscape. Whereas once Hekla was famed for its picture-perfect volcano shape, a time that saw its slopes curving dramatically to a wide caldera, today they appear bloated and overt, as though the mountain is pregnant. See also:Volcanoes in Iceland and History of Iceland. This is, in fact, an entirely truthful analogy. Beneath that stretching rock face sits a fiery maelstrom of flaming magma and molten rock, ever churning, ever waiting for the right moment to burst from its confines. In the Middle Ages, Hekla was known as “The Gateway to Hell”, but now it seems, hell may very well be coming to us. Not that Iceland is any stranger to eruptions, or indeed Hekla erupting, the volcano in question having burst 23 times since the first ever recorded, in the year 1104. When counted alongside one another, Hekla has produced amongst the largest lava flows in history, covering approximately 8 km3. Much of the tephra layers in Iceland also originated from Hekla, which today, allows scientists to date historic eruptions and prepare for any that may arise in the future. As volcanic activity continues to bubble, omnipresent, beneath the surface, Icelanders are considering not the possibility, but the reality of a new eruption, when exactly it will happen and how large it will be. One of the best ways to determine the potential impact is to cast an eye back to the previous eruptions that have occurred here, specifically those that created a high degree of disruption to daily life. However, this should not be a cause of alarm if you intend on visiting Iceland, volcanoes are not situated anywhere near Reykjavík or other larger settlements, and locals tend to flock towards the volcanoes when they erupt, rather than fleeing from them to watch the incredible spectacle. Wikimedia. Creative Commons. Hansueli Krapf. To the south of Þingvellir National Park, visitors will discover Hengill, a currently dormant volcano which covers a total area of 100km2, making it one of the larger examples of this type of feature in Iceland. Due to its sheer size, the name Hengill is often used to refer to the mountain range of which the volcano belongs, as well as the geothermal fields that stretch across southwest Iceland's seismic zone. See Also: Iceland's Golden Circle | Ultimate Guide and Top 9 Detours. Amid this great stretch of land, one will find smaller, sub-shield volcanoes, fissures and crater rows, all of which act as something of a testament to Hengill's sheer, physical presence. 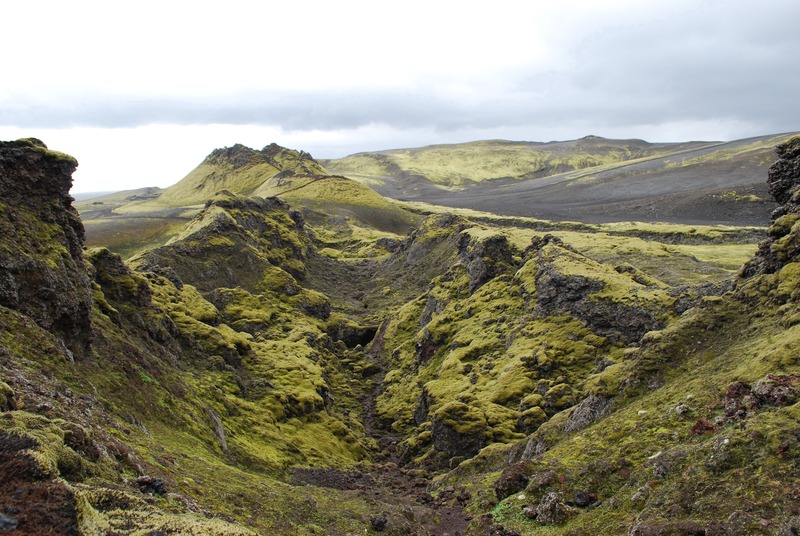 To the south of the mountain range, the lava field, Hellisheiði, provides further clues as to Hengill's historic influence; here, clearly visible, one can look upon both new and old layers of a post-glacial lava flow, acting as a reminder of the volcano's potential force. But there is a deeper understanding of Hengill's potential fury, as recorded in Kristni saga (the Book of Christianity). Written in the 13th century, the unknown author tells of an eruption that occurred during a debate at the Alþingi as to whether Iceland should forgo their pagan heritage and instead adopt Christianity. See Also: Elves, Vikings and Norse Gods in Iceland. Regardless of Hengill's current "sleep", visitors are all too aware of the volcano's underlying power, as clearly visible in the region's hot springs and geothermal valleys. This power is utilised by two power plants located at the base of the volcano Hellisheidavirkjun and Nesjavellir, the latter of which provides energy for the entire Capital Region. See Also: The 5 Best Hot Springs in Iceland. Photo from Sightseeing Flight Over Laki Craters, Glaciers and Highlands. Laki, otherwise referred to as Lakagígar (Craters of Laki), is a fissure located nearby to Eldgjá and Kirkjubæjarklaustur village in South Iceland. The area is referred to as 'craters' because volcanic activity opened the earth on either side of Laki Mountain, rather than spurting from a singular caldera, as is often visualised. Visiting Laki is only possible during the summer months due to its location in the Icelandic interior Highlands, an area that is only accessible when the loose mountain roads are clear of snow, ice and debris. The area is particularly beloved by hikers for its charming trails and unbeatable, panoramic scenery. Wikimedia. Creative Commons. Credit: Chmee2/Valtameri. It is widely believed that the enormous ash plume, blocking out the sun's life-giving rays, had such an effect on agriculture that the subsequent starvation was a direct contributor to the French Revolution in 1789. The plume was also thought to have radically shifted the typical monsoon season in Asia, only proving what a dramatic international effect Iceland's volcanoes can have. Wikimedia. Creative Commons. Author unknown. "Hekla" is the Icelandic word for "short hooded cloak", its name alluding to the volcano's shape, whilst also implying its dark, omen-like quality to the Icelandic people. As previously stated, Hekla was known in Medieval times as the "Gateway to Hell", a named earned thanks to the volcano's routinely worrying activity over the preceding centuries... and that's saying nothing of its multiple eruptions. Due to this, Hekla is one of the most famous volcanoes in Iceland, as well as one of the most recognisable with its typical sloping body and towering position on the horizon. The earliest eruptions ever recorded were in 1104, with approximately thirty taking place in the years that followed. Despite its active nature, these eruptions are still notoriously difficult to predict, with some lasting only a couple of days, while others go on for a period of months. One correlation that is widely agreed upon, however; that the longer Hekla remains dormant, the more aggressive and dangerous its eruption will finally be. The 1947 eruption of Hekla was the second largest since the first time Iceland was inhabited in 930 AD, emitting out a total of 24,000 tonnes of carbon dioxide. Not only that, but its lava flow covered a total distance of 40km2, often travelling through underground lava tubes, then reappearing at new, faraway spots on the surface. Approximately 98 farms were damaged in the eruption, though by 1970, only two of these were no longer being farmed. It was only until the 19th century and the rise of modern scientific thinking that the belief in Hekla as a gateway to hell finally diminished. This is despite the fact that, even today, legends still permeate that, each Easter, witches will congregate at the foot of Hekla to practise their black magic. Katla is one of Iceland's most active volcanoes, averaging two eruptions each century. The volcano's name is derived from the Icelandic word for 'Kettle' (ketill), alluding to the ever-churning internal pressure that Katla has become so known for over the last ten centuries. Located on the South Coast, the volcano is covered by the enormous glacier, Mýrdalsjökull; the ice, whilst usually filling in the volcano's vents and fissures, makes the nature of Katla's eruptions incredibly violent, hurtling ice, ash and rock for many surrounding miles. This also means that glacial flooding is a direct and predictable result of eruptions at Katla. One of Katla's most notorious eruptions, and in fact the last to burst its glacial confines, occurred one century ago. The volcano's 1918 eruption lasted 24 days, extending Iceland's South Coast by five kilometres. In the years before construction was finished on The Ring Road, travellers feared to journey in the volcano's shadow due to the frequent jökulhlaups (glacial floods) that continued to ravage the surrounding area. "The time for Katla to erupt is coming close ... we have prepared ... it is high time for European governments and airline authorities all over Europe and the world to start planning for the eventual Katla eruption". Wikimedia. Creative Commons. Howell Williams. Named after Surtr, a fire jötunn, the tiny island of Surtsey did not exist before 1963, only rising above sea level as an inlet of its own after an enormous underwater eruption began approximately 130 metres deep. Today, Surtsey is a spittle of a land in its own right, while also holding the lofty title of Iceland's most southern territory. It is found approximately 32 kilometres off the South Coast of Iceland and measures out at 1.4 km2. Its current size is much smaller than previously due to constant erosion from the wind and rain. The eruption came unexpectedly, having started a number of days beforehand beneath the surface. The event was first confirmed by the cook of a fishing trawler, the Ísleifur II, who at first believed the rising black smoke to be a sign of a burning ship. Upon directing their vessel closer, explosive mini-eruptions beneath the water made it clear to the crew they had discovered an off-shore volcano. Wikimedia. Creative Commons. Credit: NOAA. This eruption reached the surface on 14th November and would continue on until 5th June 1967, at which point the island had reached 2.7 km2 (1.0 sq mi) in size. 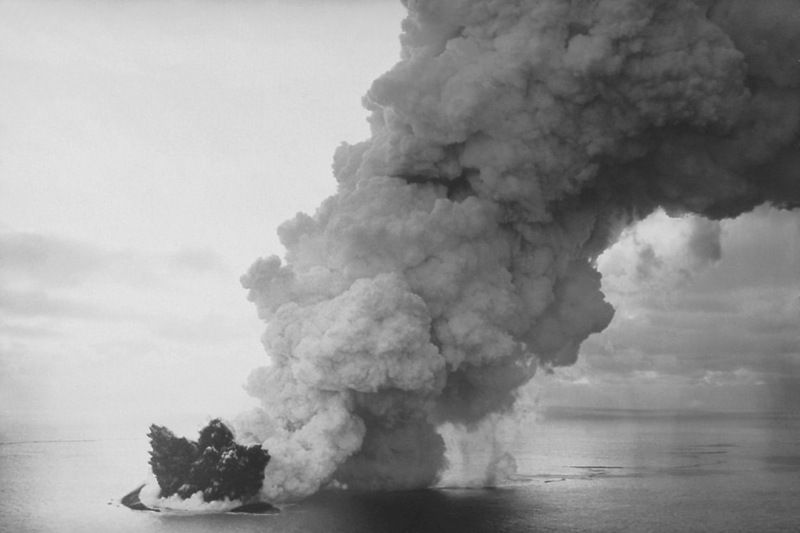 The accompanying photograph shows the newly forming island in its earliest stages and provides an example of just how constant, and just how ominous its cloud of black smoke was. As of 2008, the island of Surtsey is an official UNESCO World Heritage Site and can only be visited by those studying its geology and biodiversity. In this sense, the UNESCO World Heritage website describes Surtsey as "a pristine natural laboratory, free from human interference". Since research began back in the sixties, scientists have seen over sixty types of plant life grow and over eighty-nine species of nesting birds. Information such as this provides an incredible record of how land comes to be colonised by native and invasive species. January 23, 1973: The east side of the Icelandic island, Heimaey, part of the Westman Islands, suddenly experiences an enormous tear in the earth's crust, with fire, ash and rock hurtling outward in a hellish blaze. The volcano, Eldfell, has exploded without warning. Life on this seemingly sleepy little island suddenly resembled a scene from an action flick, with billows of demonic black smoke cutting into the morning's pale sky. As good fortune would have it, the winds were blowing from the south, meaning that the town was not immediately overcome with ash. This left enough time for the townsfolk to evacuate the island, utilising the fishing boats that, thankfully, were still in the harbour that morning due to bad weather. See Also: Things That Can Kill You in Iceland. By the end of the day, only 500 of the island's inhabitants remained stationed there, the majority of whom were acting policeman, fireman or who held a position that in some way was vital to the situation. As the lava flows continued, there was concern that the harbour might become enclosed, meaning the townsfolk were forever spraying the lava with seawater in an attempt to halt it. And their attempt paid off! As time would have it, however, the island's harbour ended up being more protected than previously. By the time the eruption was officially over, on July 3rd, nearly a third of island's buildings and homes had been destroyed, whilst the rest of the land was covered in a thick layer of ash. One man had died in the disaster. Many of those who lost their property to the eruption chose not to return to the island, though a group of new arrivals readily took their place in the hopes of restoring the town. See Also: Westman Islands Tours. Eyjafjallajökull’s fiery breakthrough has since been considered one of the integral catalysts that transformed Iceland’s position as a travel destination, pulling the country from its financial slump into prosperity. The reasons for this, of course, lay in the enormous disruptions caused to European air travel that year due to the volcano's ash cloud. This, naturally, caused numerous travel delays, meaning that angry flyers were quick to seek out where the root of their problems lay... and they lay in Iceland? Where even is Iceland? Because of Iceland's natural beauty, friendly culture and enriching history, it wasn't long until this collective anger transformed into something quite opposite; a yearning to visit... That very year, a group of travellers would set the trend to come, making Iceland one of the hottest vacation destinations on the globe, (figuratively speaking, of course). This is then a rare example of how what is often perceived to be ‘a natural disaster’ can, in fact, have incredibly beneficial effects for the culture in question. Not that this is a common occurrence in the great scope of things, don't get me wrong, but in the case of Iceland, a country with only a spattering of people, this particular eruption certainly had consequences that can only be described as culturally positive. Eyjafjallajökull made headlines across the world not due to its size (it was, in fact, relatively small in comparison to the rest of our list), but because of its ability to disrupt the travel plans of thousands of Europeans. As the above video demonstrates quite beautifully, news reports, particularly in the US, further added to the attention as viral videos continued to play upon the fact that anchors were hilariously incapable of pronouncing Eyjafjallajökull. Bárðarbunga is Iceland's largest volcano and second largest mountain; situated under the country's most domineering and extensive glacier, Vatnajökull. 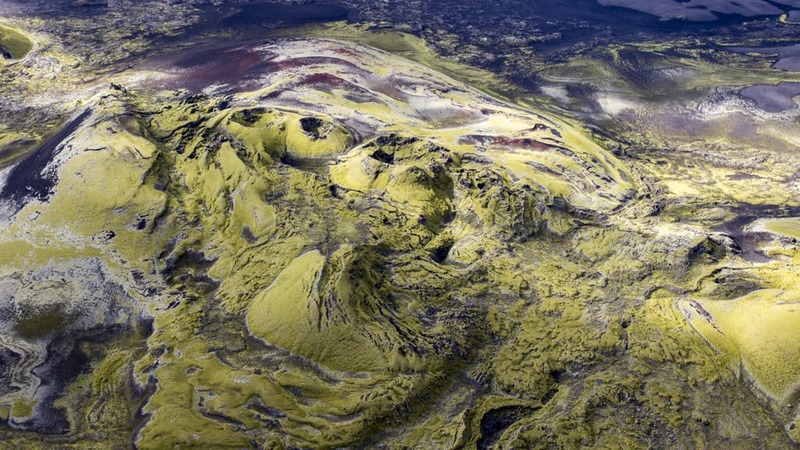 Bárðarbunga is itself part of a volcanic system that stretches for approximately 200 kilometres. Due to its hard-to-access location, Bárðarbunga has been little-known to scientists until recently, though it is thought the volcano erupts every 50 years or so. From 2007, it seemed that Bárðarbunga's volcanic activity was slowly but surely beginning to grow, drawing the concern and attention of scientists across the country. This activity faltered briefly upon the eruption at the nearby Grímsvötn in 2011, then quickly began rising again in the proceeding years. Bárðarbunga's long eruption period presented fantastic opportunities for photographers in Iceland, almost all of whom were eager to snapshot the furious battle between fire and ice. It's clear to see why; nothing else, quite so naturally or succinctly, can better capture the stark contrasts that come with Iceland's raging forces of nature. The eruption also reinvigorated interest in specialist volcano tourism, allowing guests to get up close and personal with this force of nature. As with Eyjafjallajökull's 2010 eruption, Bárðarbunga has been far more of a help than a hindrance to Iceland's tourism industry. Today, visitors to Iceland routinely take helicopter tours to some of the country's most well-known volcanoes, even landing on their peaks, or alternatively, choose to partake in an Into The Volcano tour, exploring inside the dormant caldera of Thrihnukagigur. Did you enjoy our article The Most Infamous Eruptions in Icelandic History? Did you partake in a volcano tour whilst in Iceland, and if so, how did you find the experience? Make sure to leave your thoughts and queries in the Facebook Comments' box below.